Welcome to Ginko Studios' website. 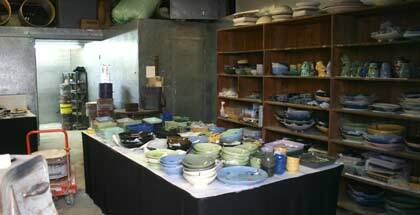 Our pottery and tiles are hand-crafted with colored porcelain. The detailed surface designs are created with inlays sliced from nerikome logs. Since the entire clay body is colored through and through, the designs and color of Ginko-ware will never rub off and the fine detail of every piece is dishwasher-safe. We hope you will enjoy our work whether it be a decoration for your home or office, special-occasion dinner-ware or your favorite everyday coffee mug. Ginko Studios will be open for visitors November 16-17 and 23-24, 11 a.m. to 6 p.m. John Christenson's work will be at the Annex Building. Sunyong & Philippe's collaborative, outdoor sculpture "Lotus" is finally installed. Funded by the City of Austin's Art in Public Places program, it consists of a 12' diameter floor mosaic by Sunyong and seven, 9' tall vertical "petals," and a low fountain carved by Philippe. Here's a review by Robert Faires that appeared in the Austin Chronicle. If you have trouble getting to that online article, you can download it as a PDF here. To make full use of this website, the latest Flash plug-in is necessary. If you see a little ginko leaf at the top of this column, you have the plug-in. If not, it is available as an easy, free download. To get it, click here. If you would like to download our PDF format catalogues, you will need the free Adobe Acrobat Reader plug-in. You probably have it but if you don't, you can download it here.